A friend of mine gave me an album called Load by this band called Metallica. The adolescent part of me, just coming out of a pop era, wanted to venture out. You know how that age is right? Trying to rebel, looking for symbols that help fuel this rebellion? ‘Mama Said’, a song from the album was the one that started my journey with Metallica. 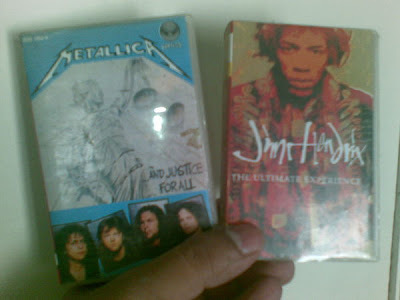 From Load to ReLoad and the ever energetic song ‘Fuel’, paved my sure shot hold on Metallica. Hetfield became God. He ruled my musical devotion till I went further back to discover Jim Morrison. I realized praying to one God was not enough. The songs of the album Load will always have a special place in my memories. Though the album is not so critically acclaimed (ReLoad rated even lower). It was my first full-fledged Metallica album. Oh and what songs! House that Jack Built, Until it Sleeps, Bleeding Me, Thorn Within, Outlaw Torn! Endless listening to a recorded cassette on a Sony Walkman. Those were the days when I used to immerse in a single album and listen to it day-in-day-out. From Load and then ReLoad, I went back. The Black album happened. What a revelation it was. The old sound of the band was even more awesome. Full of rage that appealed to the changes that I had to face around. ‘College and growing up’ does not sound as good as ‘College and growing up with Metallica’. Words cannot describe the soothing effect the songs had when I used to lie in my bed late at nights with Hetfield, Hammett et al singing me lullabies; the lullabies that resonated with my anger for the world that I could not understand. Then during sometime in 2001-02, I got my hands on some college deposit refund that went right into funding ‘And Justice for All’ along with Jimi Hendrix’s greatest hits. I had heard ‘One’ before but with this album came a sound and feelings that were darker than ever. Metallica was coming out of the Cliff Burton era and most of the songs had painful and poignant dedications to him. Give a listen to ‘To live is to die’ and you would know what I am talking about. Another month or two was spent in playing this album over and over again. With the entry of the .mp3 format and computers... you know how the songs started pouring. Ride the Lightning, Master of Puppets and Kill ‘em All were immediately given a shot. But the charm of listening to one album over and over again was lost. So much for having a choice. But Metallica stayed. Lingered on. Hetfield still gripped the angst that was plucked by Hammett’s guitar and resonated appropriately by Ulrich and Newstead. Sometime around mid-June 2011, we heard that Metallica was coming to India. Their first ever trip to India. Decades of wait to see them live was suddenly not just a dream. It was going to happen. As soon as the haze lifted, intense planning was initiated to ensure that tickets were available and booked. We, a country so full of Metallica fans, were sure to go all guns blazing to be there to see them live. 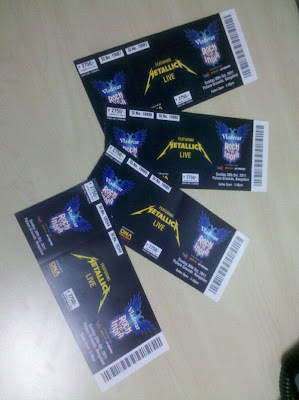 Metallica was to perform in Bangalore on 30th Oct, 2011. Tickets were booked 2 months in advance. Information was shared with like-minded fans. Friends went crazy on social forums. Then the tickets arrived. Oh the happiness. Something tangible. So the dream was realizing. The train journey happened. 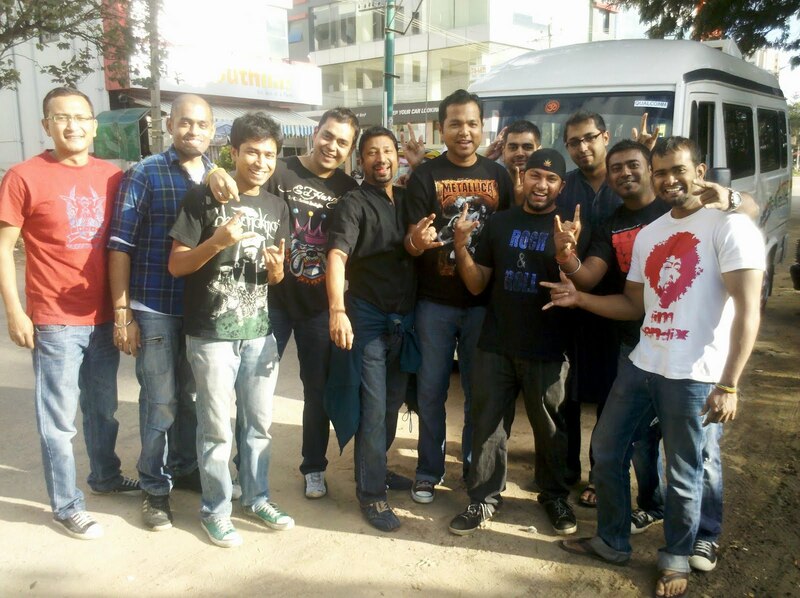 We arrived a day in advance in the rock loving city Bangalore. Lovely weather greeted us. Slight rain, slight sun. Pleasant cool temperature. A friend of a friend showed the most awesome courtesy that anyone can offer and happily allowed us to stay at his place. A friend who had a Metallica poster framed on his wall. Now you know what I am talking about! The craze was slowly filling up everywhere. YEAH YEAH was one of the cries that kept on repeating on people’s mind. Everyone had waited for so long, me included. This benevolent soul of a friend then went overboard and booked a bus for 12 people. The bus, filled with 12 Metallica fans. The bus with a super music system that played the songs we were soon going to hear live. Beer flowed in the bus. Anxiety reaching a peak. One of the Big 4 were going to perform. Metallica was going to perform. We entered the venue an hour or two before the Metallica show. It was raining a bit, but all it dampened was the soil on the ground. We waited and waited till they started testing the drums and guitar. Imagine the response from a crazy crowd that was around 30,000-35,000 strong. The sense of time soon evaporated. Hetfield came along. Hammett, Ulrich and Trujillo followed. What then followed was a hysteria for close to 2 hours or 18 songs. Even Hetfield was surprised when people sang with him. Oh Bangalore you rocked. And HOW! Words will not capture the feelings that filled almost every person who was present for the concert. Dream became a reality and suddenly the reality was so dreamily-beautiful that I started questioning. Did it really happen? It did. And it was AWESOME! Amazing the way you have written it. A wave passed through me for seconds. Amazing!